Not much of note has been going on around here, other than the weather getting chillier and wetter. I had last Thursday and Friday off, so I spent a lot of time putting a bunch of things from my fall harvest together into a meal to bring to work on Saturday for a mini-potluck. I made bean tamales, butternut squash empanadas, colcannon, and persimmon crisp. It all went over well. Rei is quite the little mischief-maker in the yard. He apparently feels that anything within reach is fair game to be a chew toy--including, as I discovered, a bunch of cables that were attached to the exterior of the house. O_O He chewed one of them completely through...thank goodness it wasn't an electrical wire! I grabbed a roll of duct tape to affix all the wires flat against the side of the house so they wouldn't be such a temptation. (Hopefully I can come up with a more permanent solution soon.) 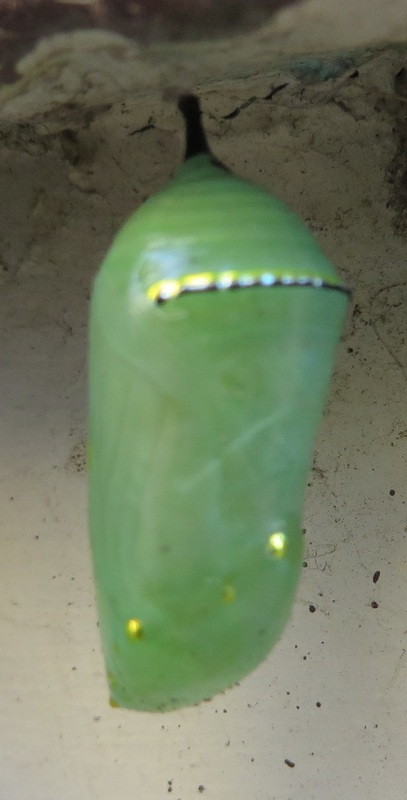 While I was doing that, I came across a monarch butterfly chrysalis attached to the side of the house near the wires. That means at least one of the caterpillars has survived, yay! I made bean tamales, butternut squash empanadas, colcannon, and persimmon crisp. That sounds delicious. You grew butternut squash? I assume it grew well or you wouldn't have been able to cook with it. Any other winter squash in the garden? So glad Rei wasn't injured in his latest chewing adventure. Fur babies are almost as anxiety-inducing as furless ones. Yes, it was actually a volunteer plant that sprouted from the compost. I got 6 squash off it, so it did really well. Any other winter squash in the garden? I grew one called Dostal Cucumber Squash that looks kind of like a zucchini, a delicata squash, and in the front yard I had a kabocha. Fur babies are almost as anxiety-inducing as furless ones.